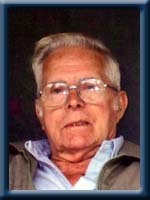 Wamboldt- Douglas Carmen, 80, of Milton, Queens County, passed away peacefully in Harbourview Haven, Lunenburg on Thursday, June 14th, 2012 with his family by his side. Born in Milton, he was the son of the late Cecil and Beatrice (Muree) Wamboldt. Doug was a long time employee with STENPRO Liverpool, working as a carpentry foreman up until his retirement. He is survived by his wife Elsie (Croft), daughters Sally Martin and Susan (Christopher) Whynot both of Milton, Beverly Roy of Liverpool. Son Douglas (Valerie) of Brooklyn. Daughter in law Carlie Croft of Milton as well as many grandchildren and great grandchildren. Sisters Inez (Charles) Eaton of Milton, Marion Gardner of Ontario, Kathleen Yuill of Alberta. Brothers Donald (Gail) of Toronto, Roger (Geraldine) and Lloyd, both of Milton. He was predeceased by his son Borden, brothers George and James “Bud”. Cremation has taken place under the direction of Chandlers’ Funeral Home, Liverpool, A graveside funeral service will be held Tuesday, June 19th, 2012 at 2:00 p.m. in Milton Community Cemetery, Milton.. No flowers by request. Donations may be made to Harbourview Haven, Lunenburg or the Spina Bifida and Hydrocephalus Association of Nova Scotia. Online condolences may be made to www.chandlersfuneral.com. So sorry for your loss , our thoughts are with you all at this sad time. Dear Elsie,Sally and family.So sorry to her of Dougs passing,He is pain free and in a much better place now..May God be with you all at this sad time..
Elsie, Sally, Susan, Bev, and Dougie we are so sorry to hear of Doug’s passing. He was a wonderful friend and neighbor and a joy to know. He will be sadly missed. Thinking of you all in this sad time. So sorry to hear of Dougs passing. Our deepest sympathy goes out to you all. We will keep you all in our thoughts and prayers. our deepest sympathy to you and all your family at this sad time. you will be in our thoughts and prayers. so sorry to hear of the passing of Doug. Our deepest sympathy to you and your family.Keep memories close to your heart. Whats it like up there? Up in the skies? We dreaded this day, but said our goodbyes. just know that someday, we’ll all be there. you received your special wings, they’re light as a feather. Brother,Husband, Dad, Grandfather, Great grandfather, and many more great things. You where a wonderful man, in my book.You where the first one who gave me a chance to work in the carpentry shop at Steel and Engines.Even when work was slow you always found us something to to keep busy so you wouldn’t have to lay anyone off.Take Care Buddy and Rest in peace.Until we meet again,Take Care ! !Condolences to the Family ans our prayers and thoughts are with you. Elsie and family .I am sorry to hear of Dougs Passing . A great man has gone from our lives ,.I remember allways a smile and a big hi . He will be missed . Prayers are sent you way . Katherine Wamboldt .ARCHIBALD . Frank, Jane and Andrew, would like to send you all our Sincere Heartfelt Sympathy for the Loss of your Love One. Bless his family and friends with comfort of Heart in accepting His Glorious Departure from birth here on earth to Life Everlasting in Gods Promised Paradise. He was a very Brave and Courageous man who fought his terrible illness with Dignity. Doug is now at Peace in the arms of Our Beloved Father, Lord Jesus Christ. God Bless and Keep His Soul Safe For All Eternity. I am so sorry to hear of Doug’s passing. He was a truly kind gentle man. My condolences to you all. It’s a very sad time , keeping the good memories will perhaps help with the difficult times ahead without him. Time does not heal but as it passes it does make it a little easier. Take care of one another. Doug ,Valerie and family…so sorry to hear the sad news., my sincere sympathy to you all….Hold on to the great memories which will be with you forever. We are so sorry about Doug’s passing-he was a great man and father. My love goes out to the family. We are travelling back to Nova Scotia and in transit so I have not been able to reach Bev. Tell Bev, Austin and the rest of the family they are in our prayers and may you have comfort. Love to Elsie. I’m thinking about all of you during this sad time. My sincerely sympathy to the entire family. Our Thoughts and Prayers Are With You In Your Time Of Sorrow. So very sorry to hear of your loss. I worked at Stenpro and drove to work with Doug for a time years ago. I enjoyed those time that we talked together travelling back and forth to work. He was one of the good guys. I know that with the love of family, friends and the good lord you will make it through these tough times. Our prayers and thoughts are with you all. Sorry to hear of Doug’s passing. My brother will be deeply missed. Wish I could be there. My thoughts and prayers are with you all. we are sorry to hear of your loss. our thoughts and prayers are with you all. We are so sorry to hear of Dougs passing. Our thoughts and prayers are with all of you. Elsie, Sally and family, so sorry to hear of your loss. Thoughts and prayers are with you. So sorry for your loss. I knew Doug from Stenpro and always found him to be quiet and nice. I never saw him upset. God bless you and comfort you. I was so sorry to hear about your loss. I never knew Doug personally but he must have been quite a gentleman from all the good things I heard about him from his loving family. Please take care of yourselves and know that someday you will all meet again. Thinking of you all.God Bless.